DCC aims to ascertain, coordinate and express the views of our community. DCC seeks to promote Dennistoun as a positive and inclusive neighbourhood. News posts to your inbox. Easy to unsubscribe from at any time. Copyright © 2011-2019 Dennistoun Community Council. Creative Commons content acknowledged where used. Dennistoun Councillor Kim Long has arranged a drop-in meeting with Glasgow Airport in relation to the new flightpath consultation, to allow members of the public to meet directly with airport staff and find out how these changes may affect them. This meeting will be held between 5pm and 8pm on Wednesday 28th March at Whitehill Secondary School, Onslow Drive, Dennistoun, G31 2QF. Glasgow Airport are undertaking a consultation regarding proposed changes to approach and departure flight paths and procedures arising from updates to air traffic control navigation systems due to take place in 2019. Dennistoun Community Council has been identified as a consultee. 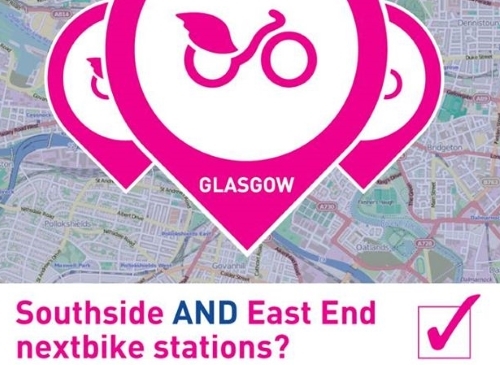 By popular demand, we are very pleased to confirm that 10 new nextbike stations will soon open across the South Side and East End of Glasgow. And Dennistoun is a part of the expansion. Would you like to see the Glasgow hire bikes come to Dennistoun? See below for the story so far. Are You Ready For Winter? At this time of year especially, everyone across Scotland is being encouraged to think ahead and be prepared for all kinds of winter weather. Whether it is at home, on the move, in the workplace, or in your community, we all need to consider the risk of severe weather. Continue reading Are You Ready For Winter? Posted on January 8, 2015 January 8, 2015 Categories Local NewsTags police, public transport, safety, transport scotlandLeave a comment on Are You Ready For Winter? Some people experience difficulty getting to hospitals by public transport in the evening, particularly older people, people living with a disability, or in receipt of benefits. The Evening Hospital Visitor Transport Service will collect you from your home (or as near as possible), take you to your nearest hospital and take you home again. A series of local events are being held for residents and businesses near Commonwealth Games venues or cultural live sites, offering useful information on the changes they can expect to see in the lead up to and during Games time, how to prepare for potential alterations to daily routines and how to ensure they can make the most of the opportunity to get involved. Throughout March, Glasgow City Council, Glasgow 2014 Ltd and Police Scotland are holding local information sessions to help you find out more about what hosting the Games in Glasgow will mean for you. Snow Wardens support Glasgow City Council Land and Environmental Services‘ (LES) winter gritting service by co-ordinating groups of local volunteers to hand grit locations important to their local communities. Dennistoun Community Council has previously held public meetings to discuss local bus services. Further information on the outcome, including a response from First Buses can be found via DCC news posts here and here. More recently, Patrick Harvie MSP has written to DCC to inform us of the Better Buses campaign that is underway, which aims to take the most important bus-related issues and develop a plan for better buses that can be taken to parliament.